Today, just over half of the world’s population lives in cities. By the middle of the 21st century this figure will likely be near 75%. The future is decidedly urban. Those who care about the well-being of humanity must naturally be concerned with how cities work; for when they function well, people are happier and healthier (and other species as well). At least since the early days of the Industrial Revolution, when the skies were black with coal dust, and poor factory workers huddled together in squalid housing, city planners and utopians dreamt of manufacturing the well-ordered city. They envisioned a place where each worker has access to clean air, open space, and roads laid out in a rational manner. They advocated for better living through planning—the imposition of top-down solutions to urban problems. At the national level, the planning of entire economies has come and gone. Experiments with socialism in the Soviet Union and China, for example, have ended in failure. Yet, the urge to impose plans and rules on cities remains strong—an urge deeply rooted in the DNA of local government, be it through zoning, strict building regulations, or detailed glossy planning documents that seek to dictate the future city form. But those who study the economics of cities remain skeptical that order can be imposed from above. As Alain Bertaud argues in his masterful book, Order without Design, it doesn’t work for nations, and it doesn’t work cities. But, to this day, the planners of the world just don’t trust the marketplace. They observe disorder and conclude it must be bad. Bertaud sees otherwise. The market does create order, but only if we let it. For over a half-century, Bertaud was a city planner. His first job, in 1965, was as an “Urban Inspector,” charged with issuing (or denying) housing permits in Tlemcen, Algeria. Over the years, he rose to the position of Principal Urban Planner at the World Bank. Throughout his long career he has helped plan or consult on numerous projects in cities of all stripes and sizes from those in socialist Russia and China to Haiti and India. He has observed much about the way cities work, or not. 3D Rendering of Population Density in Jakarta and London. Source: Alain Bertaud. The argument of the book is thus quite simple: that planners and economists should work together when developing urban policies. That much seems reasonable—who would dispute that two heads are better than one? But the next premise is likely a harder pill to swallow—that the city planners of the world need to learn and understand how markets work. This is particularly difficult because economics says that the planning profession has gotten things wrong. There are only a limited number of reasons planners should intervene. The rest can, and should, be taken care of by the market itself. Bertaud argues that urban economic theorists—through the use of math-based models—have generated several vital conclusions that need to be mastered if cities are going to function better. First is the need to view the city—fundamentally—as a labor market, as an agora or bazaar where residents can easily find matches between their own skills and the needed skills of employers. Successful matching is the path to higher incomes and the end of poverty. Second, the city-as-labor-market requires maximum mobility and flexibility, so that people and businesses can find each other, and they can readjust their matches and housing as circumstances change. Geographic mobility is the route to social and economic mobility. Third, people don’t like to commute, and they are willing to pay higher housing costs to live close to their jobs. Therefore, long commutes must be compensated through lower-cost housing in the suburbs. If land markets operate properly, dense living in smaller units in the central city and less-dense living the suburbs is the result of households balancing the tradeoff, and thus choosing what’s best for them. Fourth, the footprint of the city—how far it extends into the countryside—is a result of the economics. Cities expand further out because residents have higher incomes, a more efficient transportation network, and/or a less productive agricultural hinterland. Sprawl is thus, at its heart, a result of free choice, and can be an efficient allocation of land. Lastly, labor markets and residential flexibility must be mediated through a well-functioning land market, where the prices of land reflect the relative demand for different locations throughout the city. When events change, the prices need to change too in order to incentivize repurposing the land for its most productive use. The planning profession, however, is more focused on limiting or restricting land uses and housing density. Rules are designed to preserve or prevent “bad” things from happening. Building height limitations are meant to lower density and shadows. Public housing projects are designed to give minimum size shelter to the poor. Zoning rules prevent single-family homes from being converted into apartment buildings. Bars and restaurants are banned from getting too close to residences. The fundamental problem with these regulations is that, in an attempt to create order, they ignore the need for flexibility and density. Prohibiting or slowing down this flexibly drives unintended outcomes that are often worse than the problems they seek to solve. Bertaud offers numerous examples from his global sojourns. But here I highlight a few. The point is that to function well, a city needs a relatively open market for land. The more restrictions placed on the land the less it can be used to serve the needs of its residents as times change. Master Plan for Hanoi. Source: Perkins-Eastman. Bertaud argues that the need for urban planning is still crucial, but just not in the way most planners believe. Their job should be to perform four vital tasks, and leave the market to do the rest. First is to design and manage transportation systems to promote maximum flexibility and speed of movement. The book demonstrates that there is no one best way to do this, and each city needs to develop a method based on its history and the preferences of its residents. Cars can work as well as subways, if policies are correctly designed. The next intervention relates to so-called public goods, such as parks, streets, and other infrastructure. Here planning is vital, as the city needs to provide them since the market will not. However, the trick is not to go overboard. Creating vast greenbelts that enclose the city and generate more rural space than is needed for recreation distorts incentives, reduces flexibility, and raises housing prices. Planners should be ready to add needed infrastructure as the demand for it emerges. Third is regulating the negative spillovers, or externalities, that arise from concentrated living. Driving, for example, generates congestion and pollution during rush hour, and contributes to climate change. Planners need to focus on how to accurately price the use of roads to minimize the negative impacts. Similarly, with building heights. If tall buildings create shadows, then the solution is not to impose arbitrary building height limits, but to adjust the incentives, say through (Pigovian) taxes, so people internalize their impacts on society at large. Lastly, planners should maintain constant vigilance about the effects of regulations on cities. Rules that were designed decades ago and are no longer relevant should be removed. Planners thus need to regularly evaluate if the suite of rules and plans remain in harmony with the actual behavior and needs of its residents or if it hinders the market from doing its job. Building flexibility into the planning process will allow planners to solve problems as they crop up, without creating new ones along the way. This book is important because it highlights the necessary relationship between economics and planning. Successful cities exist in the balance between the efficiency of markets and the curbing of its excesses or failures. Too much regulation increases housing prices, fosters poverty, and reduces social and economic mobility. Too little management can generate congestion, pollution, too little green space, and excessive uncertainty. But one can’t but help think that it is not simply enough for planners to understand economics (and for economists to understand planning). Urban policies emerge from political decisions. In democratic societies, for example, policies are the result of a compromise to please—or not upset—as many constituencies as possible. So even when planners can design good policies, bad politics may drive decisions that prevent their implementation, or water them down into irrelevance or even harmfulness. It is one thing to design optimal policies, but quite another to incentivize people to go along with them. Allowing cities to reach their full potential requires flexibility, and flexibility means change. People resist change. Understanding the reasons for this is also vital for urban health. Bertaud’s book, I hope, will have an impact on the way planners see cities. Though I fear this will not be the case. My sense is that the planning profession views economics—the dismal science—as being out of touch with the nuts and bolts of running cities (and too mathematical). While economists feel that economic theory and statistical analysis is more important than the nuts and bolts of running cities. Each field has its own perspectives and way of doing things, and which continue to be propagated through graduate programs, conferences, and professional and academic journals. To be respected in each profession requires one adhere to the rules of its respective game. The tyranny of disciplines locks practitioners into their own walled intellectual cities. Bertaud’s own path is the exception that proves the rule. His route was idiosyncratic, springing from his personal curiosity combined with a lucky encounter with a friendly economist. A book like this is crucial, but change must also come from within the academies that train professionals. There needs to be more fundamental shifts in world views about the nature of urban policies and the practice of planning. New interdisciplinary programs that bring economists and planners together so they can learn from each other and allow policymakers to think more deeply about the role of land markets, and the nature of incentives and unintended outcomes would be a good start. It will take a lot more people like Bertaud to build momentum. So much rides on our ability to get cities right. Ironically, Jane Jacobs argued, in her 1960 book, The Death and Life of Great American Cities, that planners should not plan; that markets are the best way to create order. Yet, somehow, today Jacobs is the Patron Saint of Modern Planning. Her words were interpreted to mean that cities should preserve or promote the Greenwich Village neighborhood that she liked and deemed good. Planners have substituted Le Corbusier for Jacobs, but the impact on cities is just as real, albeit in a different way. As I have argued elsewhere, this issue is made somewhat more complex in the United States because of the heavy subsidies for car use and mortgage deductions which encourage sprawl. Furthermore, there is also evidence that while people like the idea of having big yards and free-standing houses, they appear to systematically overvalue them and undervalue the cost of commuting before purchasing a home. But given the large cost of moving, they often find themselves locked-in to a less desirable situation than they anticipated. as you said, it will take some time for the planners to compromise with the economics. it is academics’ duty to see the technical urban problems like an engineer. Jason, a nice review and I like your summary, particularly that economists have a way of ignoring political realities and the fact that we are (hopefully) democracies, which means balancing interests and priorities. Personally, and I know I should read the book toward pronouncing judgment, I bet Alain Bertaud is either 49 percent right or 51 percent wrong. (That’s a joke.) While planners do need to use markets more positively and as a tool, Bertaud, based on your review, is ignoring that state-directed economies work. Vietnam has lifted about 75 percent of its people out of poverty in the last decade or two, through state-directed economic plans. This includes city making. China has done the same, and it has copied South Korea, which did the same. Urban planning and design were all part of these state-led economic uplift efforts. So in the main, the planners there at least are doing something right, not wrong. 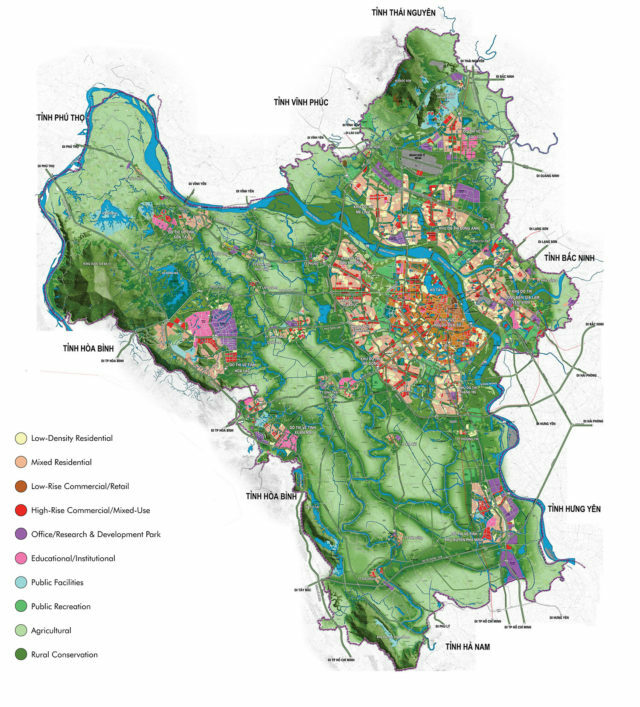 I can’t speak to whether Vietnam’s greenbelt is a good idea or bad, but if Bertaud is sticking to the old saw of letting the market work, he’s getting it mostly wrong. I have worked extensively over 30 years in the building of urban infrastructure in China, on land use regulations in Korea, and only more recently on urban transport issues in Vietnam. The success of urban development in these countries is largely due to the fact that their governments understood the role of planning and markets better than it is understood in the West. Chinese municipalities financed themselves by selling land to private developers. The planners then quickly understood the basic laws of land economics and adjusted their land use regulations to consumers demand. They fulfilled the role of that planners should have had in other countries by developing quickly the transport infrastructure that was needed to support rapid urban expansion. The subway system of Shanghai and Beijing is much longer than that of New York and was entirely built in a few decades, not a century like in New York. The new development of cluster cities now adopted by the Chinese government shows that a Communist government understands the need for spontaneous land development driven by markets. It is this spontaneous development that created the supply chains that cannot be replicated in the US or in Western Europe, as Tim Cooked recently recognized. Shenzhen, one of the most spectacular urban success story of the end of the twentieth century was not created by central planning but by creating an enclave where labor markets could function. In Shenzhen, for the first time in China, employers could select their workers, set their salaries as a function of their skills; workers could change jobs at will depending on the salary and the working conditions offered. Planners responded to the economic success of Shenzhen by creating on time a superb infrastructure and by building well-landscaped parks easily accessible to the citizen. While the Government of China and Vietnam still have features of a centrally planned economy, their urban development has been mostly guided by the pragmatic reformist approach started by Deng Xiaoping. I hope that you will read my book and then revise your judgment that “if Bertaud is sticking to the old saw of letting the market work, he’s getting it mostly wrong” . The role of planning is very important. Planners should concentrate on developing infrastructure and expanding land supply, and should not be regulating in minute details the land and floor consumption of households and firms. Very interesting Alain. You clearly have a lot more experience and knowledge of the subject than me. This line of yours is particularly intriguing: “The new development of cluster cities now adopted by the Chinese government shows that a Communist government understands the need for spontaneous land development driven by markets. It is this spontaneous development that created the supply chains that cannot be replicated in the US or in Western Europe”. I would like to understand better how that works. Does that mean essentially no zoning or prescribed land patterns? Government sells (or leases) them the land, and then the private operators can do what they want? I’m a big believer in the role of government in building infrastructure. But obviously, if you build infrastructure, land tends to be far more valuable and have much greater potential to be used. In Asian countries, government clearly know this and much consider this when deciding when to sell land to private developers. Then there’s China, when the government often has a direct interest in the project, or at least the private developers are closely linked to the government. I would like to find a way out of the American regulation trap, if there is one. I happen to be reading Dan Doctoroff’s book about his role in the development of New York City under Bloomberg. Doctoroff was deputy mayor. His background was in the private sector, and he brought a business and market perspective to government. But still, it was striking and convincing how he and his team went around the city, and seeded the ground for business development. It didn’t just happen. The Chinese system of development is evolving constantly and can be quite different from one province to another. It is constantly a mix of central planning and local experimental laissez-faire. The best illustration of this apparent contradiction that I have seen: the CBD of Chengdu in Western China (6 million people) is dominated by a gigantic statue of Chairman Mao, but a bronze statue of Adams Smith dominates the yard in front of the department of economics at Chengdu University!